PASADENA, California, October 10, 2014 (ENS) – Just one location in the U.S. Southwest is responsible for producing the largest concentration of the greenhouse gas methane seen over the United States – more than triple the standard ground-based estimate, according to a new study of satellite data by scientists at NASA and the University of Michigan. Methane traps heat in the Earth’s atmosphere and, like carbon dioxide (CO2), it contributes to global warming. But methane is 22 times more potent as a greenhouse gas than is CO2. The “hot spot,” near the Four Corners intersection of Arizona, Colorado, New Mexico and Utah, covers about 2,500 square miles (6,500 square kilometers), or an area half the size of Connecticut. In each of the seven years studied from 2003-2009, the area released about 0.59 million metric tons of methane into the atmosphere. This is almost 3.5 times the estimate for the same area in the European Union’s widely used Emissions Database for Global Atmospheric Research. The study’s lead author, Eric Kort of the University of Michigan says the study period predates the widespread use of hydraulic fracturing, known as fracking, near the hot spot. This indicates that the methane emissions should not be attributed to fracking but instead to leaks in natural gas production and processing equipment in New Mexico’s San Juan Basin, which is the most active coalbed methane production area in the country. Natural gas is 95 to 98 percent methane. Methane is colorless and odorless, making leaks hard to detect without scientific instruments. Coalbed methane is gas that lines pores and cracks within coal. In underground coal mines, it is a deadly hazard that causes fatal explosions almost every year as it seeps out of the rock. After the U.S. energy crisis of the 1970s, techniques were invented to extract the methane from the coal and use it for fuel. 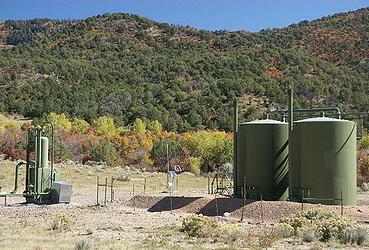 By 2012, coalbed methane supplied about eight percent of all natural gas in the United States. In the study published online today in the journal “Geophysical Research Letters,” researchers used observations made by the European Space Agency’s Scanning Imaging Absorption Spectrometer for Atmospheric Chartography (SCIAMACHY) instrument. SCIAMACHY measured greenhouse gases from 2002 to 2012. The atmospheric hot spot persisted throughout the study period. A ground station in the Total Carbon Column Observing Network, operated by the Department of Energy’s Los Alamos National Laboratory, provided independent validation of the measurement. Research scientist Christian Frankenberg of NASA’s Jet Propulsion Laboratory in Pasadena, California, first noticed the Four Corners signal 0years ago in SCIAMACHY data. Frankenberg said that the study demonstrates the unique role that space-based measurements can play in monitoring greenhouse gases.